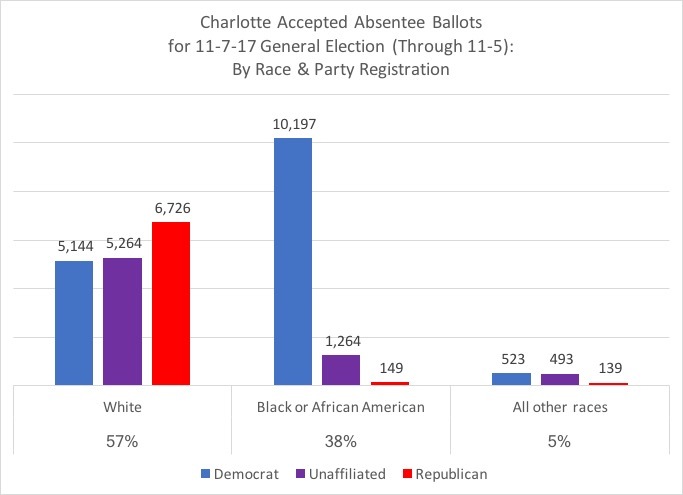 Old North State Politics: UPDATED: Charlotte's Mayoral Election: Too Close to Call or Repeating Past Democratic Advantages? UPDATED: Charlotte's Mayoral Election: Too Close to Call or Repeating Past Democratic Advantages? 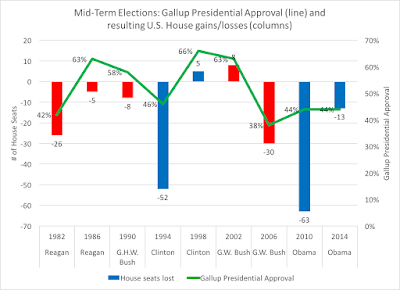 While it's an "odd year," elections in America happen every year. But in the Old North State, the major elections in 2017 are at the most local level: mayoral, city council, even school boards. 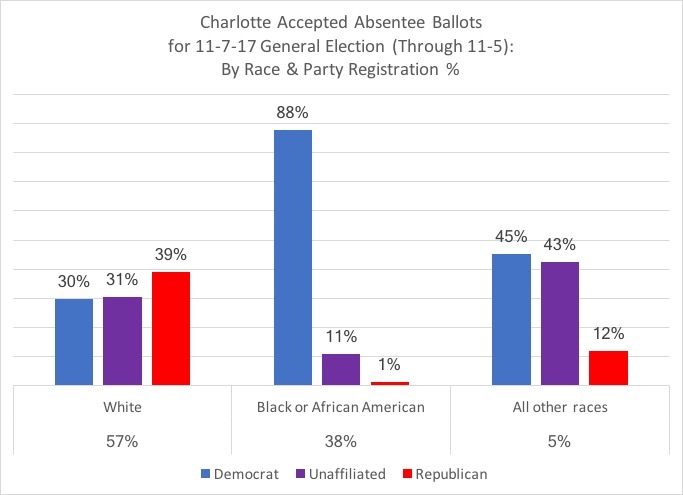 And in the region that I live in, Charlotte's mayoral election has taken on a unique perspective, from what appears by one poll to be a considerably tight race in an urban area that has trended overwhelmingly Democratic in the past few years. 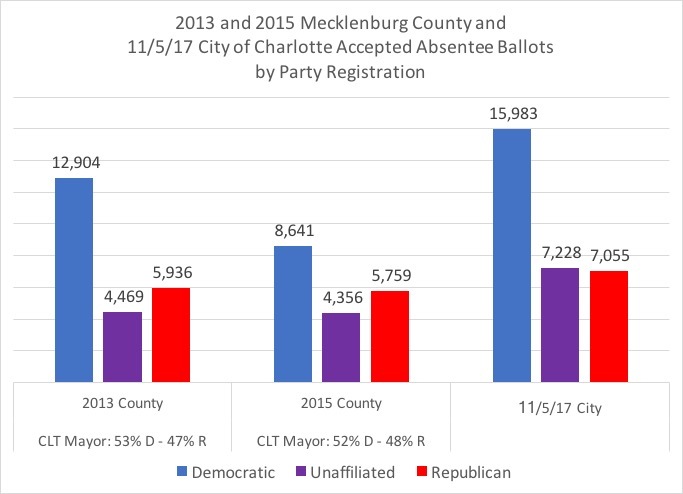 Tuesday's election will focus on Mecklenburg County (by results) and the Charlotte city elections, but with some investigation and data crunching, some early voting trends can be seen within the context of the registered voter pool within the city limits of the Queen City. Based on the North Carolina State Board of Election's voter registration numbers from Saturday, November 4, the city of Charlotte's total number of registered active and inactive voters is 551,454, with registered Democrats having 48 percent of the pool, registered unaffiliated voters at 31 percent, and registered Republicans with 21 percent (registered Libertarians are barely one percent of the pool and votes being cast, so this analysis will focus on the big three registration factions). 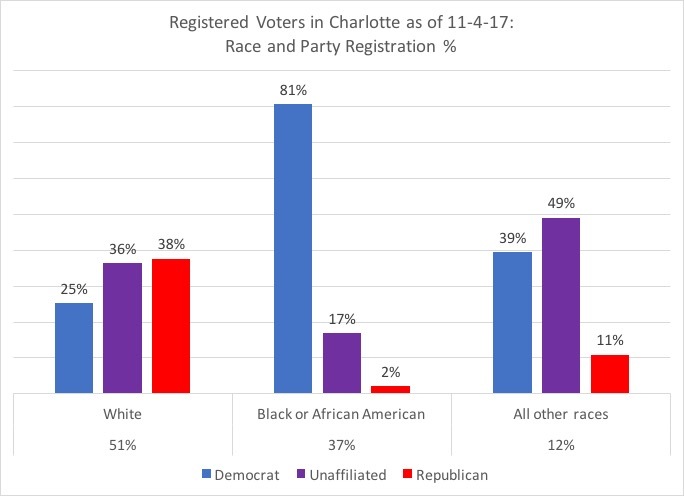 The largest voter group in Charlotte are black Democrats (at 30 percent of the total voter pool), followed by white Republicans (19 percent), white unaffiliated voters (18 percent), and then white Democrats (13 percent). One aspect of the demographic change occurring in the nation, and especially in urban areas, is the tectonic generational shift, from Baby Boomers to Millennials. 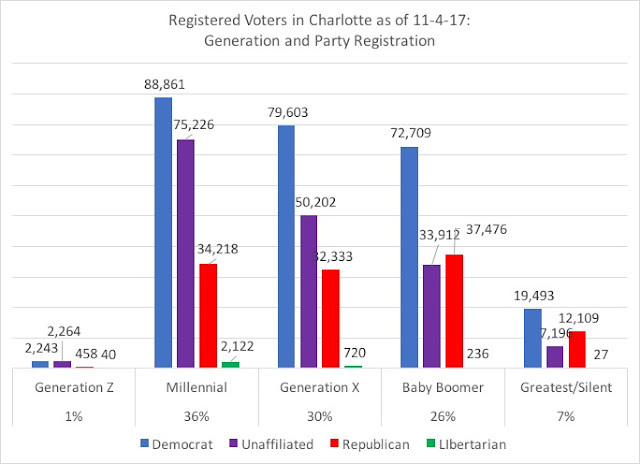 Within Charlotte's registered voter pool, a plurality of voters are Millennials, those born between 1981 and 1998 (the youngest voters who are 18 years old are now considered "Generation Z", and are factored into this analysis even though there are very few of them now). Over one-third (36 percent) of registered Charlotte voters are Millennials, with another 30 percent being in the Generation X (those born between 1965 and 1980), 26 percent being Baby Boomers (born between 1945 and 1964), and then only 7 percent are the oldest voters, those of the Greatest and Silent generations. 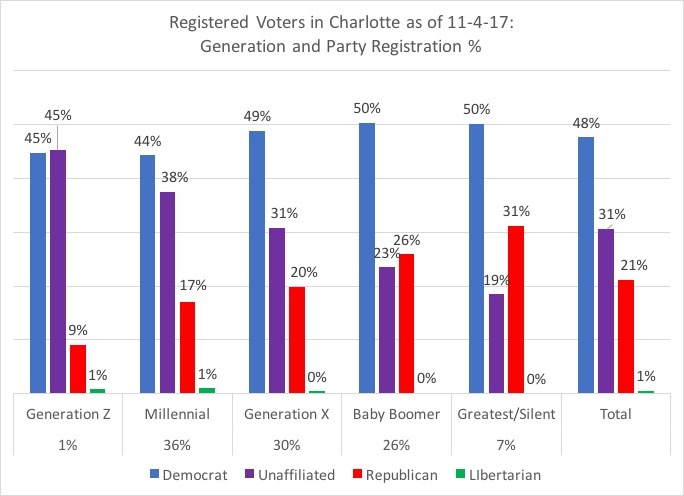 While the Democratic dominance is apparent within the generations, the steady rise of the "unaffiliated" registered voter in the state is reflected within Charlotte as well, with registered Republicans experiencing a noticeable decline in affiliation: only 17 percent of Millennials are registering with the GOP within Charlotte. This analysis sets up the "electorate" that can be drawn from for Tuesday's general election, but voting has already begun in the Queen City, with a surprising increase in early voters over the past two municipal election years (2013 and 2015). In both 2013 and 2015, the Democratic mayoral candidates received 52 to 53 percent of the vote, while the Republican mayoral candidate received 47 to 48 percent. 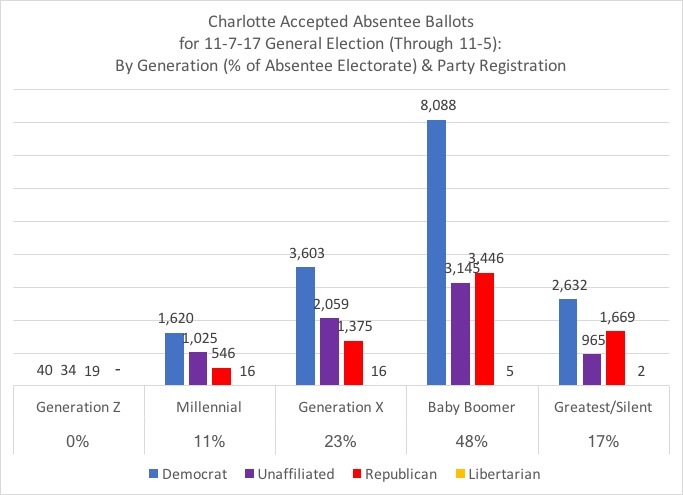 Typically, North Carolinians have come to embrace the opportunity to "cast their votes early" through one-stop in-person absentee balloting, which closed this past Saturday. In comparing what appears to be the early final numbers for city early voting to the 2013 and 2015 county early voting numbers (unfortunately, isolating the city numbers from 2013 and 2015 is rather difficult to do), one can find a surprising increase in the numbers of ballots cast, especially by party affiliation. 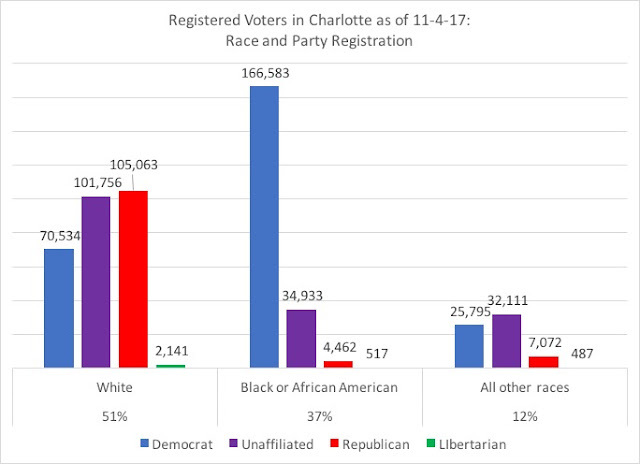 In 2013's mayoral contest between Democrat Patrick Cannon and Republican Edwin Peacock, 55 percent of the early accepted ballots in Mecklenburg County came from registered Democrats, while 25 percent were from registered Republicans and 19 percent from registered unaffiliated. The numbers dropped in 2015's race between Democrat Jennifer Roberts and Republican Peacock (running again), to 46 percent from registered Democrats, 31 percent from registered Republicans, and 23 percent from registered unaffiliated voters. 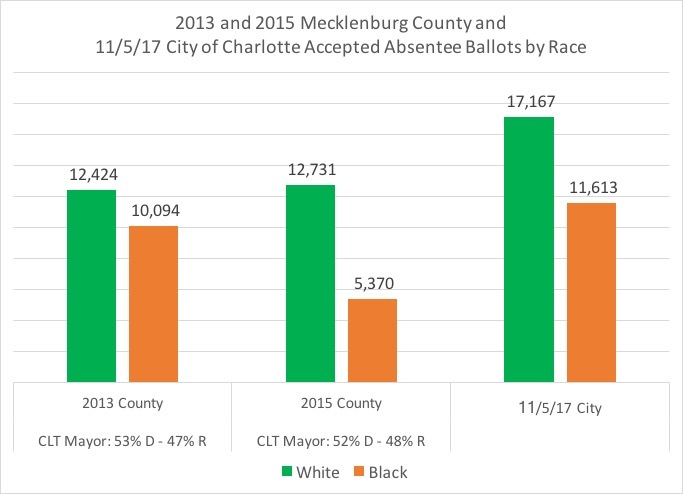 This year's increases from 2013 and 2015 have been significant; again, a reminder that the 2013 and 2015 numbers are from county-wide numbers, while the 11-5-17 numbers are from within the city of Charlotte. 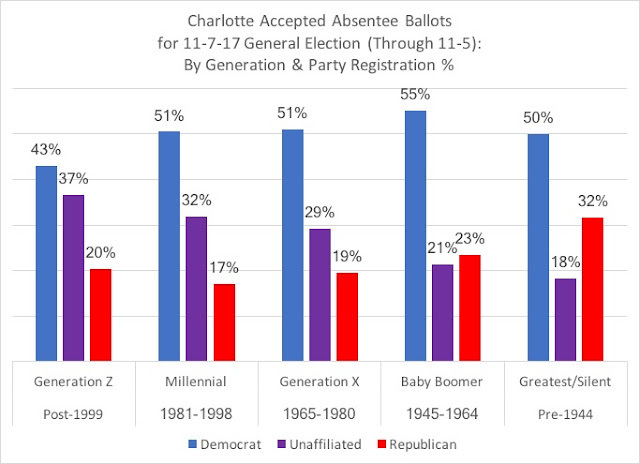 Further breaking these numbers down by both generation and race within this year's election show some important patterns and trends; first, within the generational cohorts, those casting early votes within Charlotte skew much older, with approximately two-thirds of the votes coming from Baby Boomers or older voters. Graphs are updated and corrected for just City of Charlotte absentee ballots. Previous charts incorrectly identified numbers from all of Mecklenburg County. Come Tuesday, it will be important to see if the early votes are from voters who would have shown up on Election Day, or are they new voters who are participating in what appears to be a competitive election; that analysis will probably be only available after we know the results and the final data of voter activity comes in from the county. Most estimates are for total turnout to be in the range of 15 to 20 percent of the vote for the county. 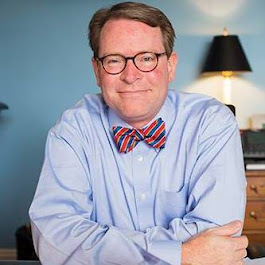 On Tuesday evening, I'll be joining the folks at WFAE for election evening coverage. I hope you can join us, or follow us on Twitter with the accounts @WFAE, @TomWFAE, and my Twitter account, @bowtiepolitics.